SPARKcon IS GRATEFUL TO THE SPONSORS WHO DO SO MUCH TO SUPPORT ART AND CREATIVITY IN THE TRIANGLE! Click here to download the 2018 sponsorship package. SPARKcon is funded in part by the City of Raleigh based on recommendations of the Raleigh Arts Commission. This project is supported by the United Arts Council of Raleigh and Wake County, with funds from the United Arts Campaign and the North Carolina Arts Council, an agency funded by the state of North Carolina and the National Endowment for the arts. SPARKcon is an open source, interdisciplinary, creativity festival held annually in Downtown Raleigh. 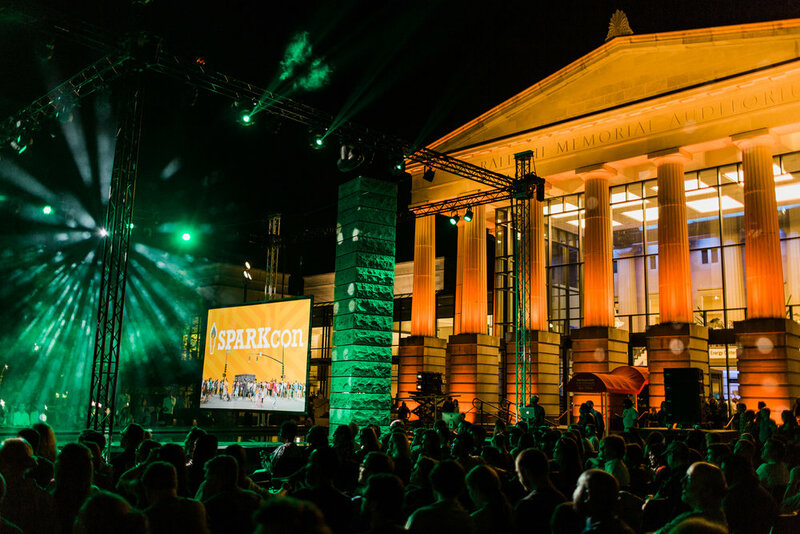 SPARKcon offers a platform for creative people to showcase their talents in 14 different categories, including theater, dance, visual art, tech, film, literature, and so much more! This platform is open to everyone because the festival is planned from the bottom up, putting creative people in charge. Through trainings and hands-on experience, VAE’s staff and the festival’s volunteer leadership team help creative people raise funds for, think through the logistics of, and produce their creative ideas using SPARKcon and its built-in audience. VAE Raleigh produces SPARKcon, but does not curate the talent or dictate what creativity is appropriate for the festival. VAE staff works FOR the artists, enabling them to use SPARKcon’s footprint and resources to explore their most experimental and exciting ideas. 80,000+ people attend SPARKcon each year. Our community is very creative, diverse, highly educated, and from across the Southeast region. The core demographic is the urban creative class, including both young professionals employed in the tech sector and families with a keen interest in downtown and the arts community. More than 50% of our attendees fall in the 25-44-year-old range. Expanded the careers of artists involved in the festivals by opening the door to museum exhibitions, gallery representation, concerts, touring contracts, and retail opportunities. Included thousands of Wake County Students as artists and sent teaching artists into 30+ schools. Five $1000 Project Seed Grants will be awarded to artists in your company’s name. These projects will be presented at SPARKcon XII and credit will be given to your company throughout life of the project. Credit for presenting four street painting workshops at two Wake County Public Schools, the North Carolina Museum of Art, and Jerry’s Artarama. SPARKcon will reserve a 10x10’ space for your very own creative display or programming. Use this space and time to connect with the SPARKcon audience or to empower your team to put together their own creative display.